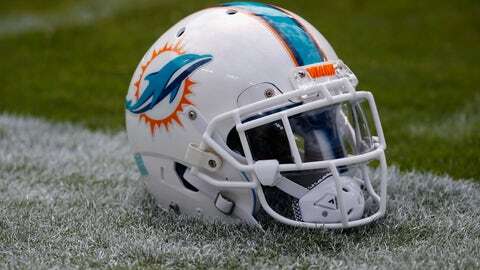 OXNARD, Calif. (AP) — Strange things seem to happen whenever Miami Dolphins assistant coach Matt Burke is making his debut in a new job. Burke has been preparing for his first game as defensive coordinator in Southern California this week because of Hurricane Irma. The storm forced the Dolphins’ season opener against the Tampa Bay Buccaneers to be moved to Week 11 with the team relocating to where the Dallas Cowboys hold training camp. But that’s nothing compared to Burke’s first game as an administrative assistant with the Tennessee Titans in 2004. Another hurricane that started with an `I’, Ivan, forced the Titans and Dolphins to make a last-minute change and play on Saturday. Burke is hoping for the same result Sunday against the Los Angeles Chargers, despite practicing next to a golf course and turning a tennis court into the weight room. He doesn’t expect the unusual backdrop to factor into the outcome. “Once we got here it’s been a normal week,” said Burke, who arrived late Sunday night. “It kind of played out where then Monday was a normal Monday for us. We treated it like such. Tuesday the same thing. Preparation has actually been normalized once we all got out here. Instead, Burke has been focused on the same last-minute tweaks as any other coach. That means preparing contingency plans for injuries and making sure the run defense is up to the task against Chargers running back Melvin Gordon. The Dolphins allowed 4.8 yards per carry last season, tied with the San Francisco 49ers for worst mark in the NFL, but Burke expects significant improvement. “I think our techniques up front have gotten better, like having another year in the system and those guys working on things,” said Burke, who served as linebackers coach under coordinator Vance Joseph last season and was promoted when Joseph was hired as head coach of the Denver Broncos. In the middle of that defensive front will likely be second-year linebacker Mike Hull after second-round draft pick Raekwon McMillan suffered a season-ending knee injury in the preseason and new free-agent signing Rey Maualuga was limited by a hamstring injury. Burke is confident Hull can step in despite being regarded as undersized for a middle linebacker. Instead of relying on physical attributes, Hull can succeed through his combination of technique and instincts, Burke said. And when Hull and the defense need to make corrections, Burke will be on the sideline to oversee those adjustments. While he has split time between the press box and the field in his coaching career, as a coordinator Burke wants to look players in the eye to make sure every lesson gets through. “I can get a better feel for that and get a pulse of the sideline and the team,” Burke said. A former college safety at Dartmouth, Burke still radiates a player’s energy. He talks about the emotional buildup to game day in the same way, and Burke’s biggest disappointment about not playing last week was not being able to unleash his pent-up aggression. Recreating that fire will not be an issue for Burke.